The festival image has shifted over time. Glastonbury, the hippy drug fest of old with all manner of scallies able to breach the perimeter fence was transformed into a veritable village of happiness and muddy fun a few years back. Now at Glasto the kids field is pretty amazing and the wider festival has appeal with pop-up theatre scattered throughout the fields and spectacles that engage the children – it’s now an attractive option for families. Other festivals created spin-offs as the organisers matured and had their own offspring – probably the most famous being Camp Bestival. Other events with a more laid back feel, such as Latitude and The Big Chill, have been child- friendlier from the start. There are now so many festivals around the country that it can be hard to choose which to go for. Kendal Calling for us a few years ago was perfect. Finn was almost two – running around burning off toddler energy and enjoying outdoor dancing but he was still cautious enough to want to stay close to us. That was our last family festival experience and with Tilly finally on her feet and on the move we have started to look for a place to go to this summer. Cloudspotting (26th-28th July) is billed as a ‘micro music, food and beer festival’. The poster we saw invites people to join them in a “woodland paradise for an intimate summer weekend of fun”. Based at Slaidburn, in the Ribble Valley, it seems far enough away from Hebden to feel like an adventure but close enough to deposit the children at the grandparent’s house should they need a couple of hours of sofa time. Quality food is vitally important when you are stuck in a field in the middle of remoteness so the lure of ‘locally sourced produce’ – especially in the foodie haven of the Ribble Valley – is strong. I wouldn’t describe myself as a muso so the fact I have only heard of one of the acts in the line-up isn’t an issue. The fab thing about Youtube is being able to check out the line-up and getting a taste of if it’s for you. I thought some of them sound bloody great. It’s described as ‘a smashing line up of music, arts and loads for the young uns to do’. It’s a pretty reasonable £70 entry fee for a full weekend camping ticket with a nominal £3 fee for under 16s for registration (slightly higher ticket price for camper vans, etc). Festivals in Spain looked tempting for a while because of the guaranteed dry weather but I suppose the rain risk is part of the traditional festival experience. I can’t order a heat wave for the last weekend in July but I am happy to pack wellies and waterproofs and hope for the best for a weekend outdoors. 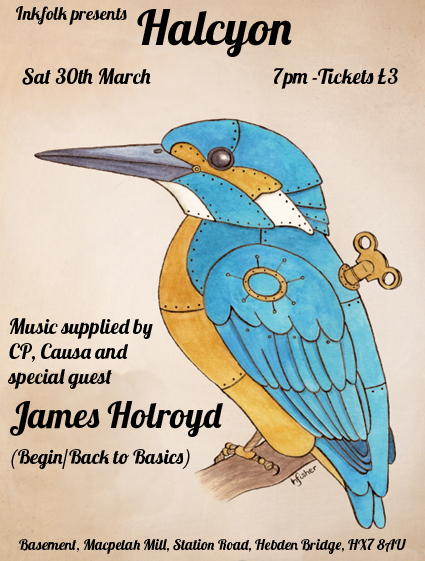 So, Inkfolk… Seen the poster around Hebden? Spotted it on Facebook? Got any idea of what it’s about? 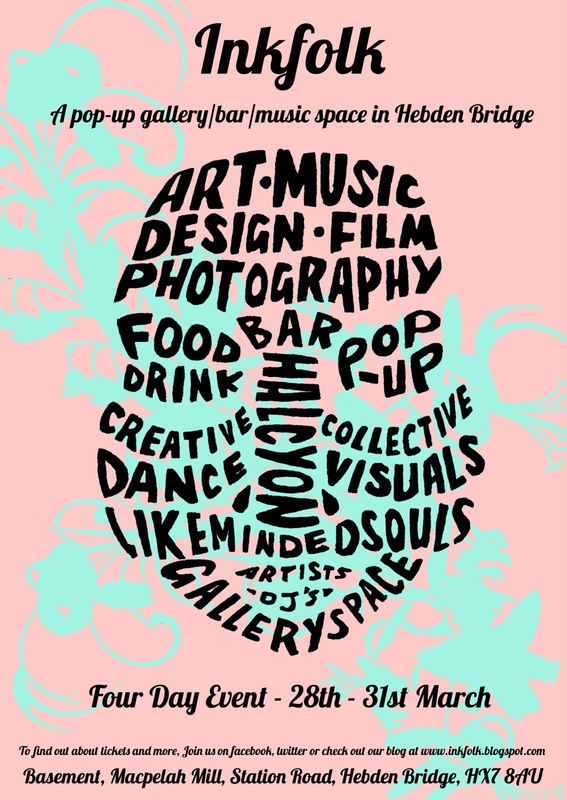 The four day event, down in the newly renovated basement of Machpelah Mill (at the junction for the station), is described as a pop-up bar, gallery and music space, and has returned this easter break. It’s the fifth session so far. And it’s not just about a night out. 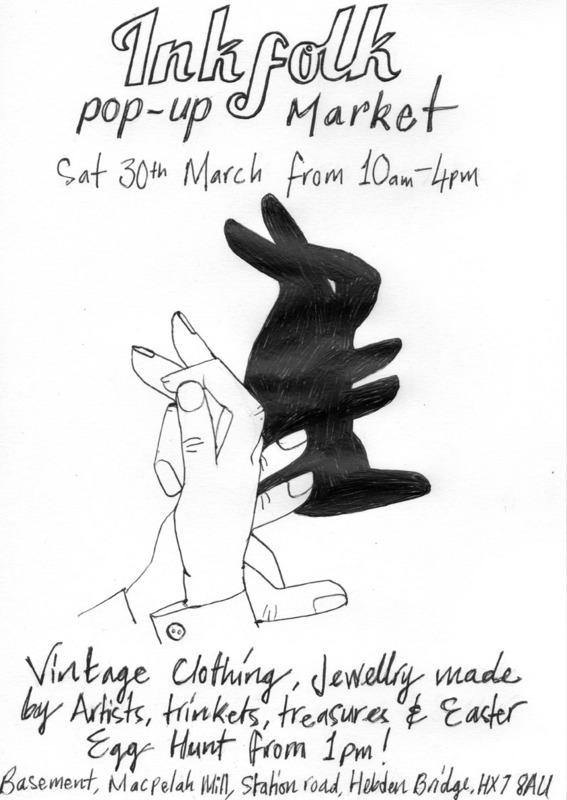 Goodies from Sailor and Lula vintage shop, Forage, Julia Breit and Forget-me-Knot Charity makes the basement a nice destination on Saturday. With a canal side garden terrace there’s might even be chance to enjoy cake and coffee in the spring sunshine (ever the optimist). There’s a licensed bar, serving local craft beers and wines if the caffeine doesn’t cut it. The fabulous Magpie Cinema has featured shorts this evening using ‘Cannes in a Van’ mini film festival on wheels. The exhibition opened on Thursday night and features work by Rowanna Lacey and Kasia Breska. Lacey’s work is called ‘Drawn Surface’ and is bespoke designs and unique illustrations applied to fabric and wallpaper among other things. What it is is lovely. Living in London for many years Rowanna has now returned to her hometown of Hebden Bridge where she lives with her partner and young son high up on the green Pennine hills. As a response to the Valley flooding, Rowanna has been inspired to develop an “illustrative anthology” under the title of ‘Stolen Sun’. Kasia is a fine artist based in Leeds in Oak House Studios and is a part of the East Street Arts group. She works with mixed media exploring non urban/wild spaces, approaching the landscapes as places with unique quality of patterns, colours, light and combination of living elements. Sunday afternoon from 1pm hosts live music from WasIst Das presenting Slomo and Colin Potter. Tickets are £7 on sale from wasistdas.bigcartel.com/ or £10 on the door. I suppose it’s good that Inkfolk is only on every few months as something as varied and successful as this means there’s little reason to leave the valley. Dream Occupation: Actress. Attending Manchester School of Acting. so hopefully one day will be a jolly good thespian! Do you come from these parts? No but I’ve lived here most my life. I was born in Luton, but I count myself as a northern lass. Describe what you are wearing today: It’s a bit chav chic/shabby chic. I like old Hollywood style but sometimes I love some big gold hoops and Adidas. I have an eclectic taste in clothes. Do you own a pair of walking boots/very sensible shoes? I have some £10 wellies and they do me pretty well for rain and snow. Do you own a pair of heels and do you get to wear them in this valley? Yes I have loads and yes I wear them in the valley. When I was growing up here I had a lot of boy mates and at the same time became interested in heels and makeup etc. I would end up running around and climbing in heels. Who is your favourite clothes maker (past or present)? I would probably say Chanel, especially back in the 50s and 60s. I also like Adidas, although that’s more of a sports make. What look are you going for? Sometimes I dress on what persona would like to be that day. And I love any excuse to dress up – like my firework on bonfire night. My favourite yet was being a mermaid for my birthday. I also like to think of everything to my hair right down to my toenails. What’s the best thing about living in Hebden? Although this is the annoying thing about Hebden I also like the fact that everyone knows each other. It’s a safe place to be. I adore our beautiful scenic surroundings, the fresh air and the wildlife. I also have made a lot of wonderful friends some young, some old and I will cherish them for life. I also like the fact that people can be who they want to be without being judged. I don’t feel right saying Marilyn as she’s far too good for me. So I don’t really know who to say? My boyfriend said it and I’m flattered but I don’t agree. Everyone needs a bit of glamour in their lives, right? Well I had more than a taste of it yesterday morning when I was involved in a photo shoot in the centre of Hebden. A few weeks ago I bumped into Chrissie from Hat Therapy (on Market Street). 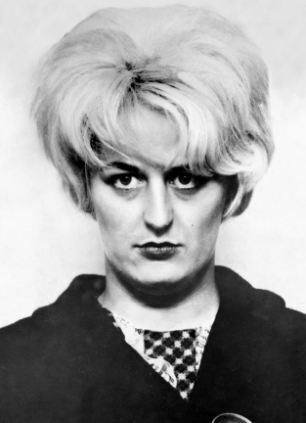 Chrissie explained she had organised a photo shoot for some new promo material she wanted. Chrissie is a milliner and I first encountered her at a WI meeting where she made floppy lifeless bits of cloth transform into incredible headpieces with little pinches and subtle adjustments. They had a brunette model for the shoot but she was hoping for a redhead too and she asked if I would be interested…I was never going to say no! It was fab. The day started with hair done by Debbie at Zeitgeist, a gorgeous salon on Carlton Street. The make up was done by an artist called Alison from York and while all this was happening Chrissie was busy prepping the pieces helped by her intern Holly. Rachel from Rachel Lucie Jewellery had brought along some pretty pieces to add to the styling. Soon Shelley, the photographer from Toast of Leeds, turned up and began to shoot. So Montessori has done the job for us and extended the nursery period for Finn. His reception year of schooling has been less about a tiny uniform and enforced sitting down at registration and more about part-time attendance at a beautiful early Victorian property in Cragg Vale. There has been lots of flexibility and emphasis on being outdoors. The wonderful child-led, calm approach has helped Finn to improve and mature on some levels but it is becoming increasingly obvious there is a need for firmer boundaries and more challenges. It has also been suggested Finn may benefit from a bigger peer group with different dynamics. Parents seem to be spoilt for choice when it comes to primary education in this area. I have counted at least nine schools within a three mile radius. A great choice is making it harder to choose. Central Street is out – it simply does not have the provision. Cragg Vale, Scout Road and Burnley Road schools have also been knocked off the list for being in the wrong place – it doesn’t make a lot of sense driving in the opposite direction to drop off at school, adding time to the morning commute. Heptonstall is also out (tried that one – great school but not the right setting for our little man). That leaves Hebden Royd, Stubbings, Old Town and Colden. And that is as long as there is a place for him. He’s very physical, exuberant, bright and is a darling (hmmm, as his mother I would say that). Conversely he is not exactly a compliant soul and is prone to noisy, testosterone-fuelled outbursts (I was once told by a child psychologist little boys of four have the same levels of the hormone relatively as a teenager of fourteen or fifteen). 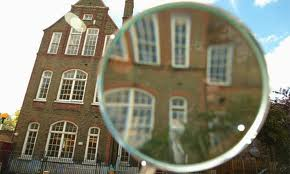 What I am looking for is fairly small class sizes with Miss Honey teaching (from Roald Dahl’s Matilda –possibly with Miss Trunchbull as a threat down the hall…minus the chokee). I’d like an emphasis on being outdoors, lots of life skills on the curriculum, the staff happy to comfort him if and when needed and learning about the wider world. Where is the place that will boost his self-esteem, further open his curious eyes and enhance his learning? While my expectations for Finn are high I am enough of a realist to know I could not offer all these things through home schooling and that we need fabulous professionals to educate Finn. Am I being reasonable in my expectations and thinking state schooling will be able to provide the answer? January, for me, is not the month to start things. In the post-Christmas slump I can’t seem to drag my sorry backside anywhere for fear I’ll be part of the high drop-out rate of newbies in a class. Today I have come over all February-like and I am wondering what to start next. If my new year’s resolution was not to start something then I suppose the positive opposite is to finish the things I have already started. And there is a long list of shelved projects. Recently a friend’s circumstances changed. No longer was she tied to the whim of others and chained to the daily drudgery of car trips and family mealtimes. It was a sudden change and she was unsure what to do with this endless amount of time. She experienced freedom in a way I can only dream about. Up for the ninth night in a row at 4am doling out the medicine in an effort to keep everyone comfortable I pondered this sense of release. What would I do with my time should I be given the space to choose for myself? In an ideal world (with an ideal self of course) I would go to Iyengar yoga on a Sunday night, a creative writing class on a Monday night, Zumba on a Tuesday, teach myself how to cook using Youtube tutorials on a Wednesday, do some writing on a Thursday, go to the cinema on a Friday (on my own so no compromise on film). And I’d get sloshed on a Saturday. I’d also buy a new old Olympus OM-1 35mm camera and get to grips with how to use it properly. I’d attend Local History Society talks. I’d learn Spanish. I’d go cycling. 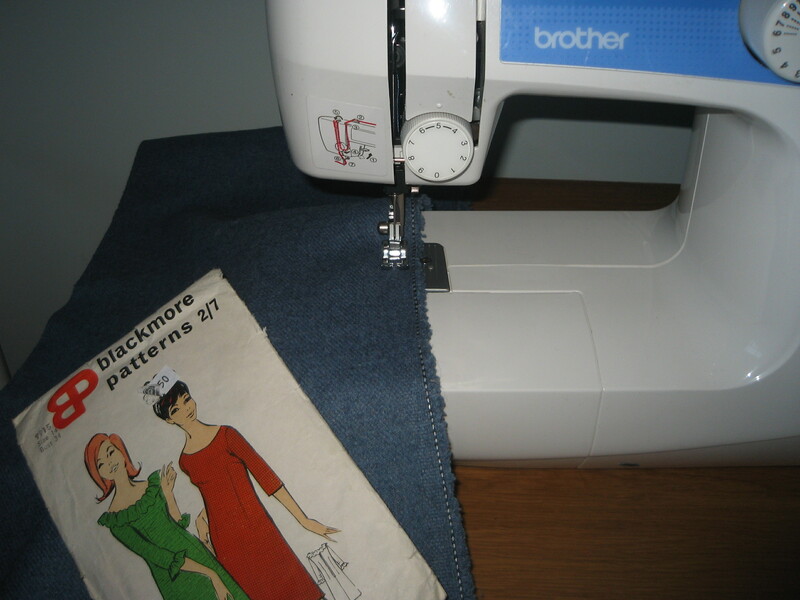 I’d sew dresses from 1960s patterns. I’d make beautiful quilts! I’d go climbing and learn how to ski. To say this place isn’t a city there are endless things to do here. The Hebden Bridge Diary http://www.hebdendiary.co.uk is printed out and left in cafes and shops all through the valley. It details a huge amount of the activities available in this area. I have known people decide to move here on the strength of that piece of paper. I’ve no idea what is ‘early morning Taize singing’ is, or ‘Nia dancing’ for that matter. I don’t have any desire for ‘Blessingway Pregnancy Yoga’ (although it was lovely at the time I did need it) or archery on a Sunday morning but it is there listed on the diary page should I change my mind. Going back to thinking about a chance of having a serious amount of free time I should be realistic enough to admit that my idealised week rota wouldn’t get a look in. In reality, I’d probably just manage possibly one regular thing at best. (Plus the getting sloshed bit). This town is known for its independent shops and eco-take on products. I find it an absolute pleasure to go present hunting less than a mile from my front door. The internet presents too much competition for these little shops but there really is no reason for this. It’s as little effort to wander down to the local shops as it is to find time to switch on the laptop and upload websites. Visit the shops and you can feel the goods (also I’m thinking prices online aren’t always what they seem when delivery charges are added). What I am lusting over this week is a practical buy. Last autumn as the skies turned grey I was delighted to find a bright green jacket from Seasalt at Dynamite Clothing on Market Street. I love it. The colour cheers up the rest of my sombre black/navy /grey wardrobe and deflects from the lack of light in the valley during these wintry months. 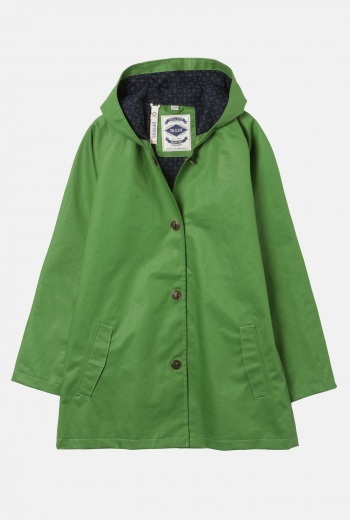 Because it is so conspicuous I feel it might be easy to over-wear this coat so I am trying to justify buying a similar piece for my work days. So here is the latest offering from Seasalt. 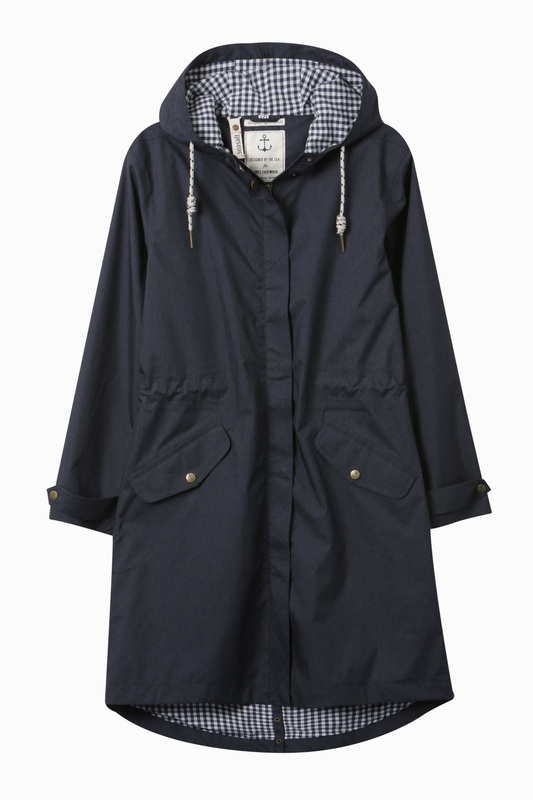 Called a ‘Hellweathers Mac’, it’s a parka style with a fishtail, leather zip pull and adjusters and a large, gorgeously gingham-lined hood. If I can encourage my employer to cover some of the cost (outerwear allowance may be applicable…) I’m off to Dynamite to buy.